The 30-3 reverse in Cardiff back in 2013 was Stuart Lancaster's nadir as England coach. Preparation only counts for so much in rugby, it is near impossible to replicate the matchday atmosphere and intensity but Lancaster has spent the run-up to Friday's Test against Wales attempting to "provide a picture" for his players of what to expect in the Millennium Stadium. The picture includes analysis of the opposition and pumping 'Hymns and Arias' into their indoor training facility to replicate the crowd noise. "One of the bits of feedback we gave the players before the game two years ago was that the acoustics of the stadium are so loud that sometimes you can't hear the communication on the field," Lancaster said. "Mike Catt kept repeatedly saying this and all the players nodded their heads and said: 'yeah, yeah, yeah.' Until they had actually experienced that they didn't really know but afterwards they all came round and said: 'you were right'. "I didn't want to leave it to chance this time around. It was only for 10 minutes but I wanted them to get the sense of what it feels like to play there. We did some phase play attack inside without the players being able to hear themselves think. We've eight players who haven't played in the Millennium Stadium before so it was preparation." Those eight players have perhaps soaked up the piped music in training more than most. "We did it for the first time today [Wednesday]," George Ford said. "We expect it to be loud and a good atmosphere down there, so it was important to practise under those situations, because we want the communication to be good so we can execute our plan." 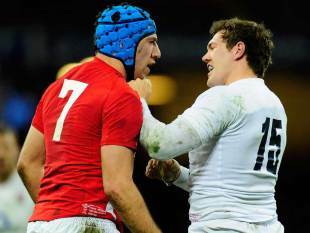 Former England captain Phil Vickery urges England to keep their cool and avenge their 2013 humbling in Cardiff. Of the 23 that featured in England's squad for the match back in 2013, just nine remain for Friday's fixture including Leicester duo Tom Croft and Dan Cole. Much water has passed under the bridge since then - the Tigers pair have been on a Lions tour - but as the expectation intensifies in the lead up to the Cardiff game, inevitably the talk reverts back to their own experience of the reverberating Welsh stadium and that fateful day two years ago. "It will be a hostile crowd but it's just noise," was Croft's take. "You can hear each other on the pitch and back in 2013 we just couldn't match the way Wales played and with that intensity. [The noise] It won't be an issue." Cole had a similarly straight-laced perspective. "You are playing in front of 80,000 people and it's loud. It was probably a step up from what I have played in front of at the Millennium Stadium before. The Welsh did live off that atmosphere but I wouldn't say the atmosphere threw us off the game. Yes there were communication issues which we have tried to iron out this week but it's a question of when it's loud you struggle to communicate from five to 10 yards away so it's about hand signals and eye-to-eye contact." For both, Friday's game will give them a chance for redemption. Croft will be on the bench on Friday but due to injury, the 2013 hammering was his last match for England. Now, two years on, when he was packing his bag for Pennyhill Park duty - he was a late call-up owing to Tom Wood's injury - out popped his stadium pass from that match. The pass is now in his dog's bed with the hope she will dispatch of it accordingly while he is away as, since 2013, Croft has done his best to put the game out of his mind. "I tried to bury it as deeply as possible, until I found that pass," Croft said. "Then I spoke to Stuart and he reminded me how I knocked it on when I was full back and then tried to kick it off the pitch and sliced it. So 'cheers, Stu'. He tells me I am on the bench and then brings me straight back down to earth." Cole has only played eight matches for Leicester since injuring his neck in the aftermath of the Scotland game last February but he believes some of the pain of that night in 2013 was has since been alleviated. Even though, reflecting on the loss, his brief summation was "it wasn't ideal". For Lancaster, the defeat, in some respects, drew a line under that particular chapter as England coach. Little things changed the following year with an emphasis on a playmaking 12 while some players in that Elite Player Squad were cast out into the international wilderness never to return again. The pain of that match still lingers with Lancaster to an extent, any defeat hurts in international rugby, but as a disciple of Bill Walsh's work, he may take particular interest in one of the old 49ers coach's notable passages of wisdom. "I think the bottom line for the coach and his squad is how they deal with frustration, disappointment and failure," Walsh said. "And I think that's really the best way to judge and to analyse a coach and a programme - it's how they rebound from frustration and failure." For England, Friday is about learning lessons from the past and ensuring the same mistakes are not made again. There are a myriad of subplots with speakers, roofs and rampaging Welsh centres no doubt issues to be discussed in the bars of Cardiff in the preamble before Friday night's match but in Lancaster's words, it is "all about winning", something echoed by Croft. "We are going down to Cardiff on Friday to make new memories," Croft said. "It is a fairly changed squad but with a few old faces in there and we are looking forward to the chance to go and play the Welsh again." England hope to bring their own noise on Friday.